Writers are inspired by countless different things – or ‘nothing’ at all. Some can pinpoint exactly what inspired a story, where others smirk and shrug ‘I don’t know where the idea came from – it just appeared.’ Those unknown idea-triggers often started from a little kernel of something deep in their subconscious that had been buried by a zillion other thoughts – too many to dig through to find that originating kernel. But what does it matter? The idea found its way out, was put to paper (ya gotta move quick - ideas can disappear so fast!) and even then the idea can morph into something else entirely through the process of writing, discovery, development and again more writing. An idea for a writer can be inspired by senses, a trigger for various emotions that can be transcribed on paper. The smell and taste of mom’s home cooking, the sound of a drill at the dentist, the feel of a handful of marbles – the possibilities are endless. A story can also be inspired by a single word, a sentence, a phrase or cliché, and even by overheard conversations. There are countless words out there and with infinite combinations – make them count! It’s all about the words. And then there are those writers inspired by a found object - something unexpected discovered at a thrift or antique store. 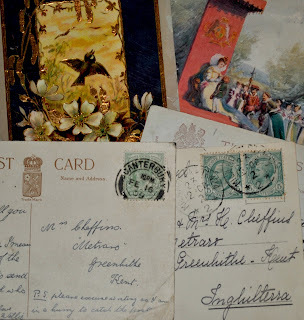 The unique and often-rare treasures tucked in the shadowed corners of stores are priceless compared to the innumerable stories they can start. 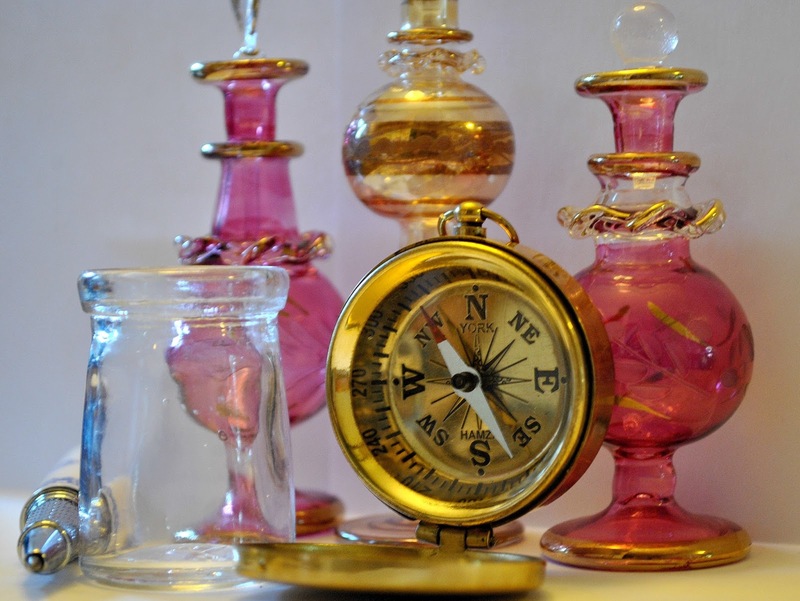 Having the object in your hands and in your home to touch, feel, admire or hate everyday (yes, sometimes an object that gives negative feelings is needed to fuel the writing) will get the creative juices flowing. Then there are my favorites – images. Picture clippings from magazines, old photos or postcards from an antique/thrift store, an old painting or an appealing photo you found online. As the cliché goes, ‘a picture is worth a thousand words.’ There are no wrong or right words – they are YOUR words laid out in the right combination and order that YOU need to tell YOUR story. And no one has to ever see those words, if that’s what you want. Not every word written needs to be destined for publication. Whether it be journal writing or writing stories for your own enjoyment, any writing is perfectly acceptable to be considered a ‘writer.’ But if you want to be a published writer, unique use and order of those words will get you far. I have found that using just an image as a prompt for writing can heightens my senses and imagination to describe the object and the emotion/memory/sense/idea it evokes. With an image you are forced to dig deeper into your imagination to get the words flowing – to describe what is being seen, felt (emotional), touched, or heard - as opposed to the object, place or person actually being right in front of you. Whether writing poetry, fiction (any genre), short or long stories, personal essays or humorous slice-of-life vignettes, all these story-starters can kick-start ideas – ideas you might not have so easily come up with in the first place. Sure ideas are there deep down in your mind and imagination, but why not use a prompt, and specifically an image, to help coax it out? 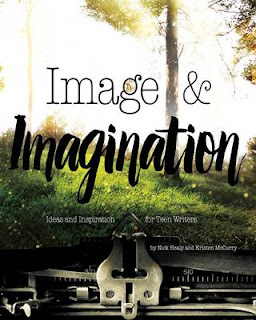 I recently discovered ‘Image and Imagination – Ideas and Inspiration for Teen Writers,’ a writing-prompt book by Nick Healy and Kristen McCurry (Switch Press, an imprint of Capstone Publishing, 2016). This hearty book of inspiration has 150 images with accompanying inspiration-inducing text. The prompts are meant to stir the mind, prompt a story, dredge-up a memory, or induce an emotion to foster writing of all kinds – fiction, non-fiction, journalling, poetry – the possibilities are endless. The book has space to jot down notes or ideas, or you can save the note-taking for a separate notebook. Although intended for teen writers, as an ‘adult’ writing for teens I have found the book a perfect inspiration for writing for the young adult market. Flipping through the thought-provoking images and accompanying text, I can tap into the teenage world of dilemma and introspective thinking teens experience during the tumultuous adolescent years. It’s been years since I was a teen (I won’t say how long ago), but these prompts bring forward feelings and experiences I had long buried in my memory, all fuel and fodder for story-building. So be sure to grab a copy and get writing, and remember: a picture is worth a thousand words.